A clinical trial is a research study that “prospectively assigns human participants or groups of humans to one or more health-related interventions to evaluate the effects on health outcomes.” Practically speaking, clinical trials are research studies that find and test new treatments or procedures. 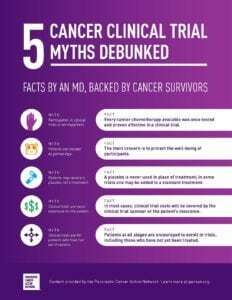 Without clinical trials, we would not have the medical and scientific advances that we have today. There is a great deal of confusion about clinical trials. This page provides resources to help you learn more about clinical trials, to dispel myths about clinical trials, and to help you find clinical trials that might be available to you. The American Cancer Society and Genentech partnered together to provide information about participating in clinical trials. Triage Cancer participated in this series of videos providing valuable information to help you understand clinical trials and make choices about what is best for you. Learn more about ACT at LearnAboutClinicalTrials.org.